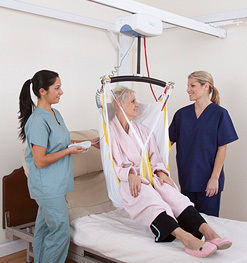 The fixed ceiling lift is often required at home when frequently used in the same location, or in care centres when a patient frequently needs the same lift. A fixed lift on ceiling tracks is recommended in such situations. Our standard model can lift up to 440 lb. We also offer models that can lift 625 lb, 800 lb and even 1,000 lb! Our lifts can be adapted to any situation. Highly variable. Everything depends on the type and length of the tracks, as well as the ceiling material. Contact us for your personnalized quotation. Also highly variable, depending on the nature of the work and the number and configuration of the tracks to be installed. Typically within one week, but sometimes in a single day.